1 What is Exabytes Hosting? If you know anything about creating websites, you might already know the importance of carefully choosing a hosting company. But if you are someone who knows nothing about creating and getting your website on the internet, let me break it down for you. Creating a website and getting it on the internet are two different things. While you can use many different ways to create your website on your own or get it designed by a Web designer, you will always need a hosting company to host your website. There are thousands of companies offering their services to you, how will you choose the one that will suit your needs best? The company of your choice should be one that is affordable, offers a variety of packages and provides amazing customer support as well. If you are struggling with making the right choice, we have an option for you – Exabytes. Let us try to know more about this company and its services in this Exabytes hosting review. Exabytes hosting services are well-known in the industry, and most of the Exabytes reviews on the internet are pretty great. You can check them out anytime you want, but make sure that you check for the reviews on reputable websites as many hosting companies spread bad reviews about their competitors. Exabytes web hosting services were launched in the year 2001. While the website was pretty small as compared to other large players that were already on the market, it grew pretty amazingly in a short span of time. 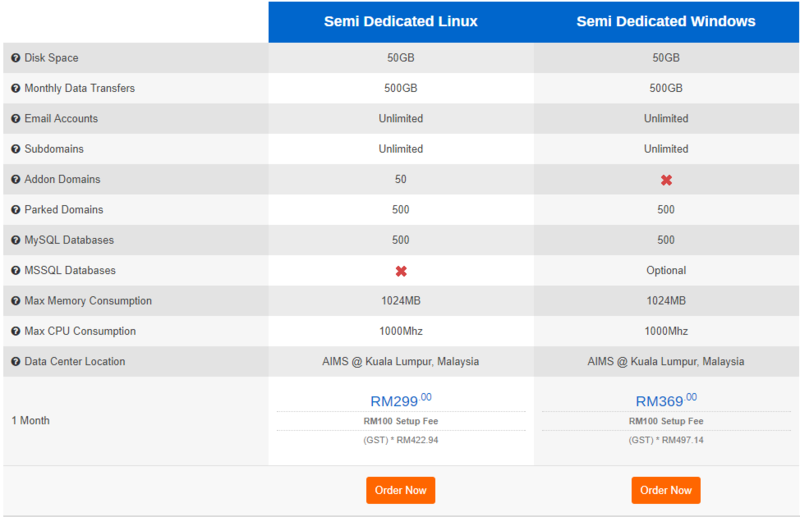 As a matter of fact, Exabytes hosting has been receiving the best hosting company award in Malaysia since 2005. So, I guess it is pretty safe to say that Exabytes web hosting services are quite satisfactory. While the performance of the company in the very beginnings was humble, it now has more than 80,000 customers who are large conglomerates and even individuals. The company serves in more than 120 countries nowadays and manages more than 1000 servers. Exabytes offers a variety of hosting plans to suit different requirements. One of the great things is they offer both Linux and Windows hosting solution. If you have a small business and are looking for a secure web hosting service, the Linux Shared Hosting plan offered by Exabytes can be a great choice. Right from e-commerce stores to blogs, anything and everything can be hosted by this service. Exabytes shared hosting service is divided into three categories – EBiz Lite, EBiz Plus and, EBiz Gold Unlimited. However, the features and add-ons of each of these three plans are different. Another great option for small businesses is the Windows Shared Hosting plan offered by Exabytes. This plan is also divided into two categories- EBiz Plus and Ebiz Gold. Moreover, you can get better features and services with the Ultimate plan. You can choose any option and pay for the plan accordingly. One great thing about Exabytes shared hosting plans is that you can save a substantial amount of money as their yearly plans are much economical. If you are looking for a secure hosting, a virtual private server might be the perfect solution for you. 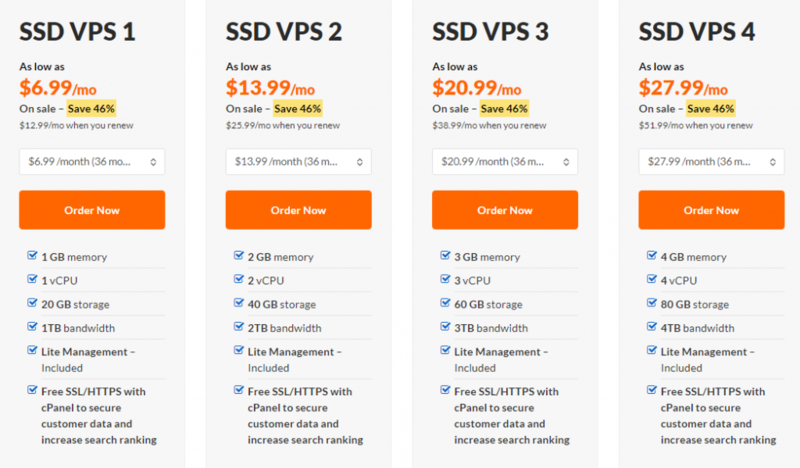 Exabytes VPS plans are available in four different categories – VPS1, VPS2, VPS3, and VPS4. Apart from these basic plans, there are also four advanced plans, such as VPS5, VPS6, VPS7, and VPS8. No matter what plan you choose, you will get DNS management, SSD with RAID 50, full root access, 10Mbps bandwidth, and 99.9% uptime guarantee. Cloud hosting is very useful for businesses that witness more traffic on their websites around some particular seasons, festivals or events. Rather than opting for a completely new hosting plan, a better option is to opt for the cloud hosting services offered by Exabytes. Simply upgrade to this service when the traffic is more and stop when the traffic reduces. The cloud hosting plans of Exabytes are divided into three categories- EBiz Cloud, Flexi Cloud Server, and Flexi Cloud Nodes. If you are looking for enhanced security and performance on your website, a semi-dedicated hosting plan from Exabytes can be a great choice. As the name suggests, the server is only shared by few websites in semi-dedicated hosting plans offered by Exabytes. Thus, making it an excellent choice for websites that witness high traffic throughout the year. With Exabytes dedicated hosting plan, most users can have a server which will only be dedicated host their websites. The dedicated servers used by Exabytes have 32GB memory, 2 x 2TB SATA hard disks and Intel Quad Core processors. From multitasking to performing heavy workload, your website is sure to function flawlessly with a dedicated server. This is one of the best plans offered by Exabytes. Reseller hosting is a type of web hosting in which the owners of the hosting accounts can use their bandwidths and hard drive spaces to host other websites for third parties. In simple words, resellers can purchase the reseller hosting plans and then can sell these plans to their clients. With Exabytes reseller plans for Linux, you can get different features, like 24 x 7 technical support, optimized servers, easy hosting access, and many other freebies. Just like the Linux reseller hosting plans, Exabytes also offers Windows reseller hosting plans. 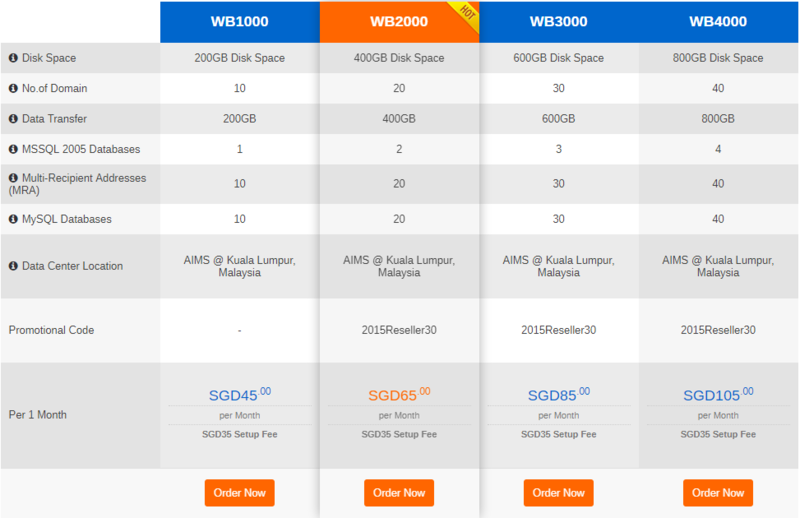 These reseller plans are divided into four categories- WB1000, WB2000, WB3000 and WB4000. Moreover, if your needs are higher than what these plans offer, you can get in touch with Exabytes to get a special plan created for you. If you are looking to create an e-commerce website, then Exabytes has a hosting solution that is exclusively designed for e-commerce stores. Moreover, the company has created a completely different website for this purpose. The company sells two different e-commerce plans – Basic and Plus. The Basic plan costs $15 per month, and the Plus pack is $25 a month. Moreover, you can also pay one year’s of fees for the packs simultaneously to enjoy discounts of about 15-16%. 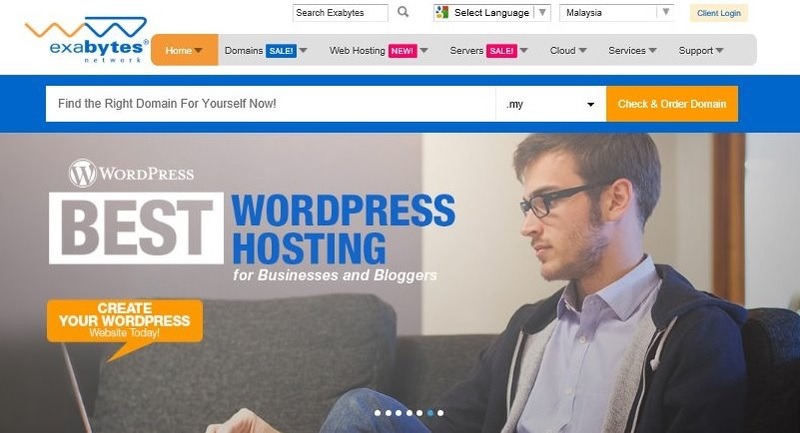 Apart from hosting services, Exabytes also offers amazing domain plans, right from .com, .my, .online, .net to .org, you can register a variety of domain names on Exabytes. You can register an Exabytes domain for 1 year, 2 years, 3 years, 5 years and 10 years. Moreover, Exabytes also offers amazing coupon codes which you can use while purchasing domains to enjoy amazing discounts. If you are concerned about the safety of your website and the information available on it, you can get it SSL-certified by Exabytes. Once your website is SSL certified, your domain name will carry the seal of security and does an excellent job of increasing the confidence of your audience on your website. Moreover, websites with SSL certificate also have a better chance of ranking higher. Exabytes offer both free and paid SSL solutions to their clients. Exabytes also offers website builder tools which you can use to create beautiful websites. Just like its plans, the website building tools are also divided into several categories, like EBiz Pro 5, EBiz Pro 10, Pro, EBiz Pro 20, and EBiz Pro 30. Free themes, drag-and-drop builder, 24 x 7 customer service, etc. are some of the bonus. Website-owners already know it is very important for them to have a mobile version for their websites, as a huge number of users now access the internet from their smartphones. As a result, Exabytes offers mobile website builder known as goMobi, which is available in two different packages – Mobile Site + Instant Design and Mobile Site. You can use these tools to create a beautiful mobile website instantly. WordPress is one of the most famous CMS (Content Management System), and a large number of users use it for their websites. As a result, many hosting companies offer WordPress-focused plans and Exabytes is no different. 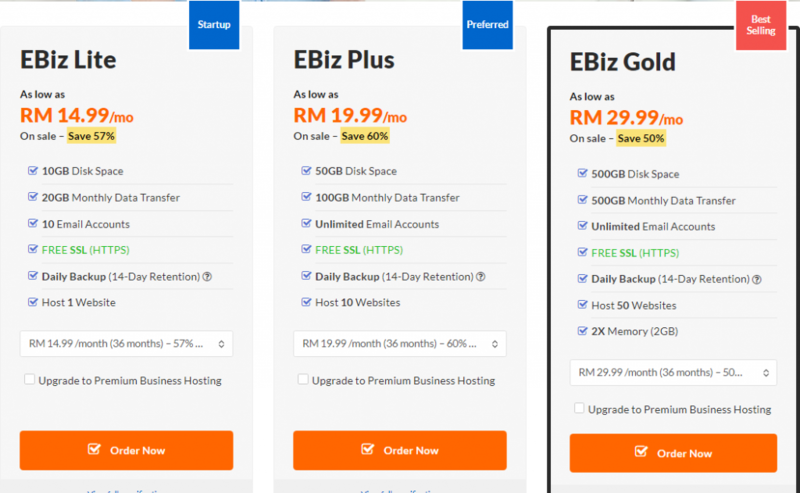 Exabytes offers three different WordPress plans – EBiz Lite, EBiz Plus, and EBiz Gold. If you have a personal blog, then Ebiz Lite plan can be great for you. Conversely, if you have a small business website, EBiz Plus plan can be an excellent choice. And if you want something more, then EBiz Gold will be a perfect match. A large number of Exabytes WordPress reviews mention that these plans work smoothly. Just register a domain, pick a hosting plan and download the WordPress software to create a custom website. Everything is pretty simple and requires minimum efforts. But if you get stuck with something, Exabytes customer service will surely be able to help you out. The support offered by different hosting companies is one of the most important considerations while choosing a particular one. The support offered by Exabytes can be termed as average. While the company claims to offer 24 x 7 support, many Exabytes reviews suggest that a large number of their representatives do not have a lot of technical knowledge. You can call them, submit a ticket right from their website. Exabytes support is available in a variety of languages, like English, Malay, Chinese, Filipino, Japanese, Indonesian, etc. So, I can give full points for that. However, the Exabytes customer service representatives with inadequate technical knowledge are not much supportive sometimes. 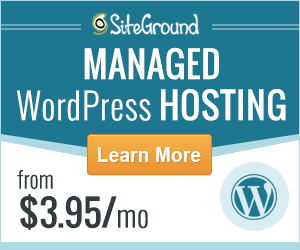 If you are looking for a web hosting company with excellent customer support, we would suggest you look at SiteGround. 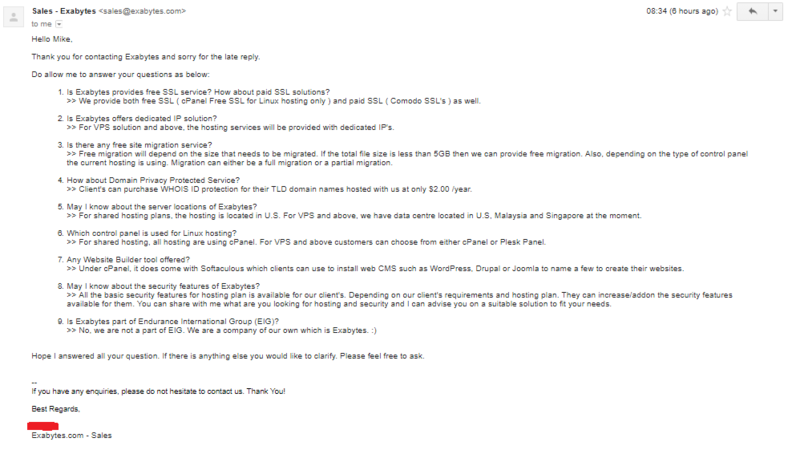 Unfortunately, Exabytes does not offer live chat service to non-customers. I wanted to test their customer support service that is why I emailed them. I had some questions in my mind which I wanted to know about Exabytes. I send them email on 1st July in the afternoon. I waited for their reply for 2 days. One of their customer support staff answered my email on 3rd July. He answered all of my questions in detail and also apologized me for the late reply. I rated their customer support 7 out of 10 because of the late response. Thank you for contacting Exabytes and sorry for the late reply. Q: Is Exabytes provides free SSL service? How about paid SSL solutions? A: We provide both free SSL ( cPanel Free SSL for Linux hosting only ) and paid SSL ( Comodo SSL’s ) as well. Q: Is Exabytes offers dedicated IP solution? A: For VPS solution and above, the hosting services will be provided with dedicated IP’s. A: Free migration will depend on the size that needs to be migrated. If the total file size is less than 5GB then we can provide free migration. Also, depending on the type of control panel the current hosting is using. Migration can either be a full migration or a partial migration. Q: How about Domain Privacy Protected Service? A: Client’s can purchase WHOIS ID protection for their TLD domain names hosted with us at only $2.00 /year. Q: May I know about the server locations of Exabytes? A: For shared hosting plans, the hosting is located in U.S. For VPS and above, we have data centre located in U.S, Malaysia and Singapore at the moment. Q: Which control panel is used for Linux hosting? A: For shared hosting, all hosting are using cPanel. For VPS and above customers can choose from either cPanel or Plesk Panel. A: Under cPanel, it does come with Softaculous which clients can use to install web CMS such as WordPress, Drupal or Joomla to name a few to create their websites. Q: May I know about the security features of Exabytes? A: All the basic security features for hosting plan is available for our client’s. Depending on our client’s requirements and hosting plan. They can increase/addon the security features available for them. You can share with me what are you looking for hosting and security and I can advise you on a suitable solution to fit your needs. Q: Is Exabytes part of Endurance International Group (EIG)? Hope I answered all your question. If there is anything else you would like to clarify. Please feel free to ask. If you visit the official website of Exabytes, you will see that they have advertised about their uptime to be 99.9%. 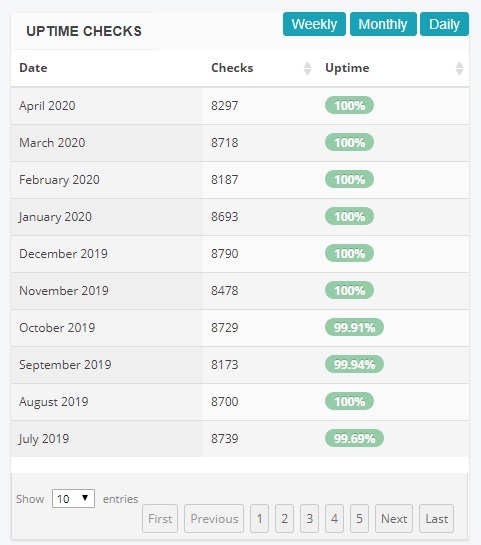 I am impressed with the fact that a large number of their clients agree that Exabytes uptime is pretty good, and I have my own records of their uptime performance. Even the Exabytes speed of loading the websites hosted by them is pretty great. While 99.9% uptime sounds too good to be true, to be frank, anything about 99% is adequate unless you have an e-commerce website or a website that witnesses huge traffic throughout the day. I wanted to attest the uptime performance of Exabytes that’s why I collected their uptime stats for last ten months. On the basis of this data, I found that Exabytes has achieved its claimed target of 99.9% uptime but only in 4 out of 10 months. 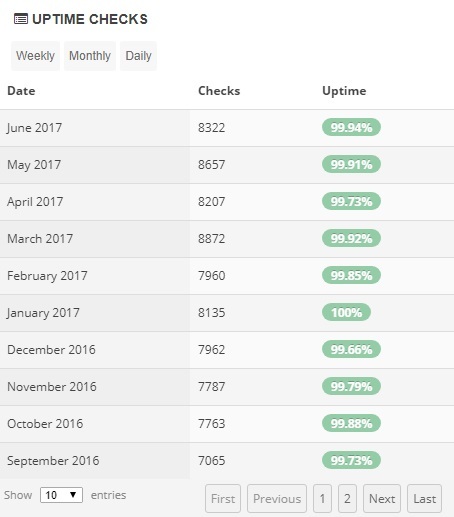 In the remaining 6 months, its uptime performance was satisfactory. The average uptime of Exabytes is found to be 99.84%, which is below their target value. Exabytes must improve its uptime performance in order to get more customers. The server response speed plays a vital role whenever it comes to choosing a web hosting company. Exabytes claims to provide fast server speed and I wanted to verify their claim that’s why I pinged my site from different locations. I got a good server response speed and overall their rating comes out to be A.
SiteLock’s TrueSpeedTM Content Delivery Network (CDN) is also offered by Exabytes that assists in speeding up the site. I must say Exabytes offers great server response speed and customers can rely on them. No matter whether you own a simple blog or an ecommerce site, the server speed of Exabytes is quite good. While Exabytes reviews on the internet are mixed, after analyzing some reviews, visiting their websites and talking to some of their customers, I came to the conclusion that Exabytes can be a great hosting choice no matter if you have a blog, small business website or a large conglomerate website. They offer amazing plans with amazing features, and if you compare their plans with others, you will see that their plans are cheaper than many other hosting providers. Moreover, the company has the ability to improve their support. I believe that the company doesn’t have anything major that should stop you from opting for their plans and services. Compare Exabytes With Our Top Ranked Web Hosts!